Wellacre Academy’s innovative Eco Centre features three Solardome® glasshouses – two SOLARDOME® Capellas and a SOLARDOME® Vega. It opened in 2011 and immediately won the prestigious International Green Apple award for the Built Environment. Two years on, we visited the Eco Centre and spent an afternoon with Richard Asha, Teacher of Science and Ecology, to see how their Solardome® glasshouses have transformed the way in which they teach. Who uses the Solardome® outdoor classrooms and how do they help you teach? We get so many different teaching subjects from across the Academy wanting to use the area. Depending on their lesson plans we have six departments using the Solardome® outdoor classrooms at different times of the year. We even get outside companies, such as the Allotment Society coming in to teach gardening skills. The domes are spacious and full of light. For me, it’s easier to work with pupils than it would be in a rectangular greenhouse and I can easily demonstrate to large groups from the middle of the work area. They provide a great practical and useable space for teaching pupils. There are no ‘dead spots’ of shade that are found in regular greenhouses. How is the Eco Centre set up? How does this add to the curriculum? I would describe it as a mini Eden Project as we have a different climate set up in each of the three Solardome® glasshouses and even have an aquatic ecosystem in place. We are currently linking one of the domes to the adjacent pond and will be using it for aquaponics – the fish waste in the pond will feed the plants in the dome and in return the plants will filter the water for the fish. With these diverse climates available we can cover a range of STEM topics, and are able to carry out numerous practical experiments. These include planting, potting on, cuttings, care of crops, efficacy of feeds and pesticides, watering, photosynthesis, environmental monitoring and remote sensing. We can also compare different fertilisers, pesticides, cutting techniques and growth yield for different planting densities. How do the domes help to improve students academically, practically and help prepare them for the future? Pupils know how to plant, grow and harvest crops from their work in the Solardome® glasshouses. 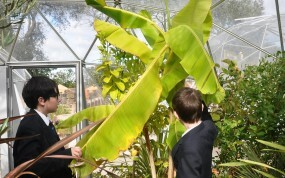 The courses developed around the Eco Centre have led to six pupils from one group to go into horticultural based jobs. Two large businesses have also agreed to offer apprenticeships to suitable pupils in the horticultural industry, as a direct result of the work going on in the Eco Centre. What do visitors like about the Solardome® glasshouses? They’re absolutely blown away with them, as are the parents, governors and the pupils. The domes provide a real talking point and seem to have a big impact on visitors – ‘it’s just like the Eden project’ are their first words or simply ‘it’s awesome’. They are extremely practical for teaching large groups – you can always see everyone as there are no places for them to hide! The pupils like them too – they think the domes look very cool and enjoy going in them. You grow flowers, plants and vegetables, what do you do with the produce? The produce from the domes is used by the food technology department at the Academy and we also sell plants at the school fair. Earlier this year we grew plants for our double award winning garden at the RHS Tatton Show, where we created a bee garden that highlighted the range of wild and cultivated plants that are beneficial to bees. Why are the Solardome® glasshouses good for senior schools? 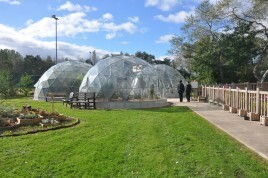 The Eco Centre domes allow us to easily demonstrate and link activities into ecology GCSE and diploma lines. Pupils feel like they are in a real horticultural environment so take activities more seriously. The Solardome® glasshouses create an environment that is great for teaching STEM subjects, especially biology, and help engage and enthuse all pupils, even those who have presented more challenging behaviour. And the domes are definitely robust and hard-wearing – we have had hockey balls bouncing off the roof whilst inside! Finally, when do you like being in the domes the most? I like the evenings the best, when the sun comes through and lights up the plants. The different shades and hues created, especially when the flowers are in bloom, are spectacular. For more information, please visit the Wellacre Academy website, watch their Eco Centre video tour or read the case study.